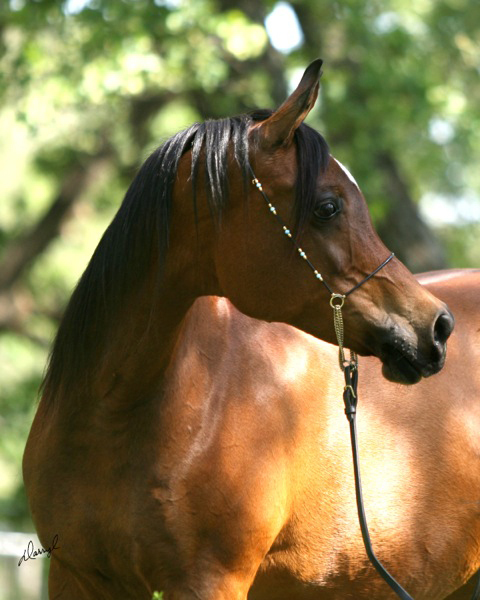 A mare of captivating beauty, femininity, and elegance, Belle Staar was one of the most extraordinary mares of her time. Her pronounced jibbah, large jowl, and beautiful eyes gave her a distinct look that was nearly impossible to capture in photos or video - her uniqueness was best experienced in the flesh. Most importantly, Belle Staar marked the beginning of a signature breeding element that is instantly recognizable in generations of her descendants throughout the world. Purchased as a weanling at her dam's side by the Geurin family of Hamilton Gates Arabians, she was destined to be a broodmare extraordinaire. 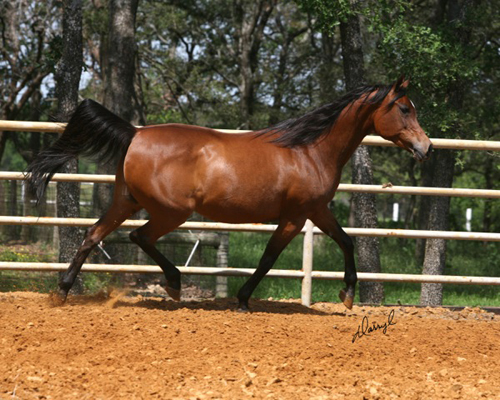 Her first-born was the exotic black mare The Vision HG by Thee Desperado. That cross was repeated several times and resulted in the black full brother The Verdict HG as well as the black full sister The Blessing HG. Additionally, there were the three full bay siblings, Thee Extreme HG, The Patriot HG, and Bandera Belle HGCA. She also produced two full sisters by Hadidi; the lovely, powerful bay Liberty HG and the ethereal grey Isabella HG, 2003 Egyptian Event Supreme Champion Mare. By the time Belle was twelve years old, the Geurin family had decided to retire from breeding. Having shared many years of close friendship with the Geurin family and a long adoration for Belle Staar, Chase Arabians was given the rare privilege of purchasing her. In the years that followed, Belle was bred to a variety of stallions, including Ansata Malik Shah, producing the grey darling Malikah Belle HGCA, *Mishaal HP who sired the typey Madinah Belle CA, Entebbe CA which produced the exotic beauty Alia Belle CA, and Makhnificent KA, which resulted in the grey, ultra feminine and last-born daughter, Staarletta Belle CA. A source of continual inspiration, Belle Staar excited breeders around the world with the infinite possibilities that could be achieved with her rare qualities. She was a mare destined to make one dream big, because with her as a foundation, all things seemed possible. Producing twelve foals in her lifetime, Belle Staar is the dam and grand dam through which many national and international champions descend. Through her famous daughter, The Vision HG, she is the maternal grand-dam of the multi national and international and World Champion Stallion *Al Lahab, his international champion full brothers *Al Raheb AA and Al *Hadiyah AA, as well as the prolific champion stallion *Al Maraam. Presently on the rise to prominence is the youngest international champion grandson Al Ayal AA. Belle possessed a wonderful inner spirit and required very little coaxing to show off. Often she would stand and blow, her delicate nostrils flaring before engaging in a light "bouncy" trot, her tail flagged straight and held high in the air. 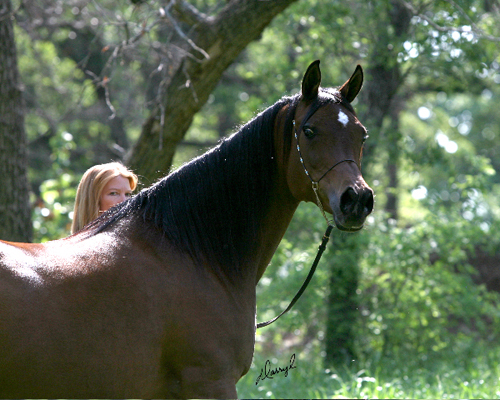 Although her overall beauty would have made her a champion contender, ironically she cared nothing for the show ring. She much preferred her role as a broodmare and was an excellent mother to all of her foals. In keeping with well-known traits of the Saklawi Jedran strain, she was exceptionally courageous and strong, possessing a quiet inner confidence. Until the moment of her passing, she exemplified an inspiring life force coupled with a stoic demeanor. Sharing life with Belle Starr was immensely fulfilling; her absence is keenly felt. One need only look at her many descendants to be reminded of her unique essence and being. She was a mare of distinction that truly founded a dynasty.